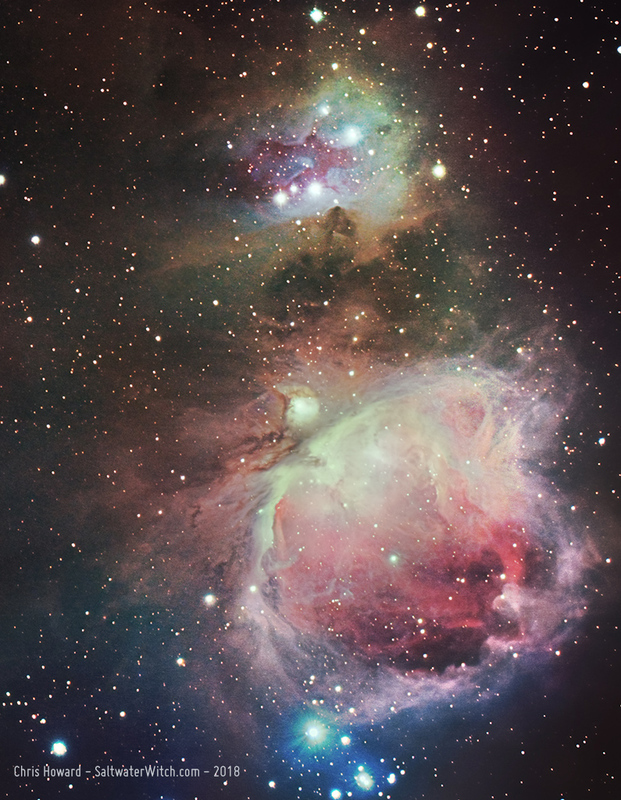 Wide-field of M42, the Orion Nebula--and it's amazing how cloudy and dusty the whole area is. 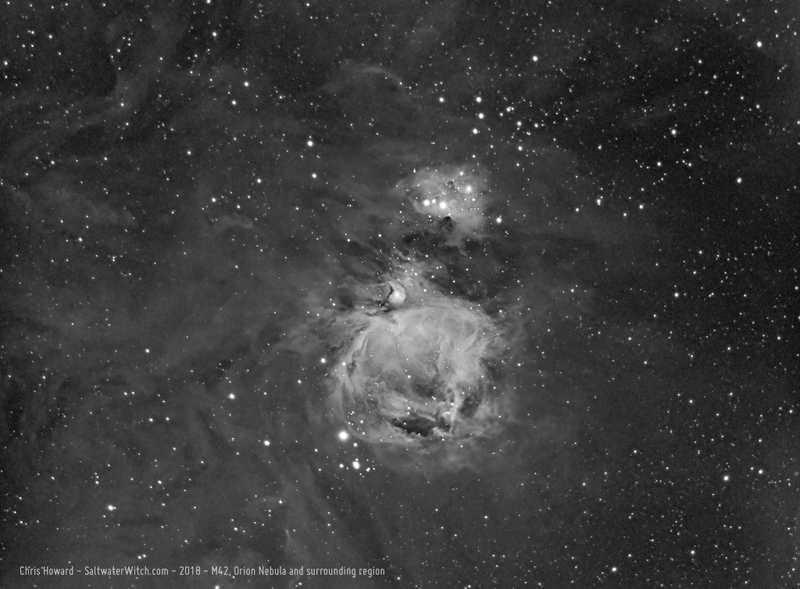 I spent half the night adjusting things--focus distance, off-axis guider spacing, but managed to capture M42 and the surrounding region (two sets of subs: 21 x 300 second, and 20 x 20 second for the bright Nebula core and Trapezium). Calibration frames: 20 Dark and 20 Bias, No flat frames. 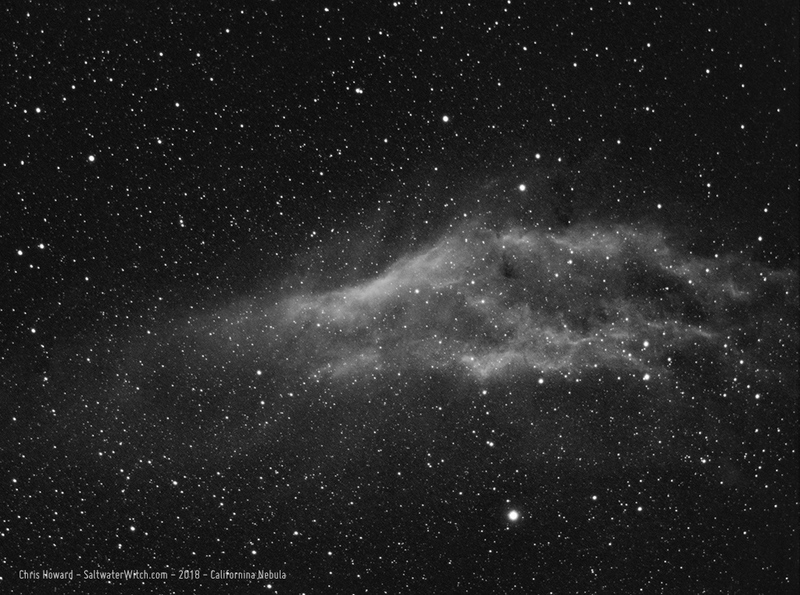 I shot these with the ZWO ASI1600MM-Pro monochrome camera, Astronomik 12nm Ha filter, William Optics ZS61 APO, iOptron CEM25P mount. 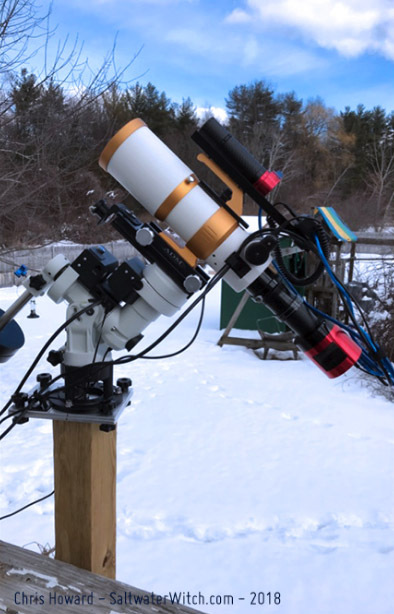 I've had the Orion Atlas EQ-G, William Optics GT81, and ZWO ASI071MC camera set up for the last three days. It's been cold--down around -10C in the early morning hours. 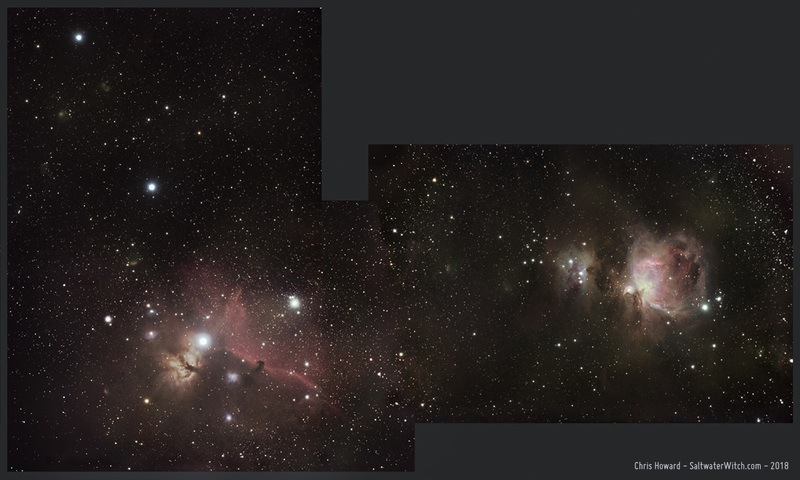 With a new moon that's slowly waxing, but still mostly absent from the night sky, I've been using the color camera to capture some amazing targets, including this three panel mosaic of the Orion Nebula (M42), Running Man Nebula, Horsehead Nebula (Barnard 33), Flame Nebula (NGC 2024), and the three giant stars in Orion's Belt, Alnitak, Alnilam, and Mintaka. 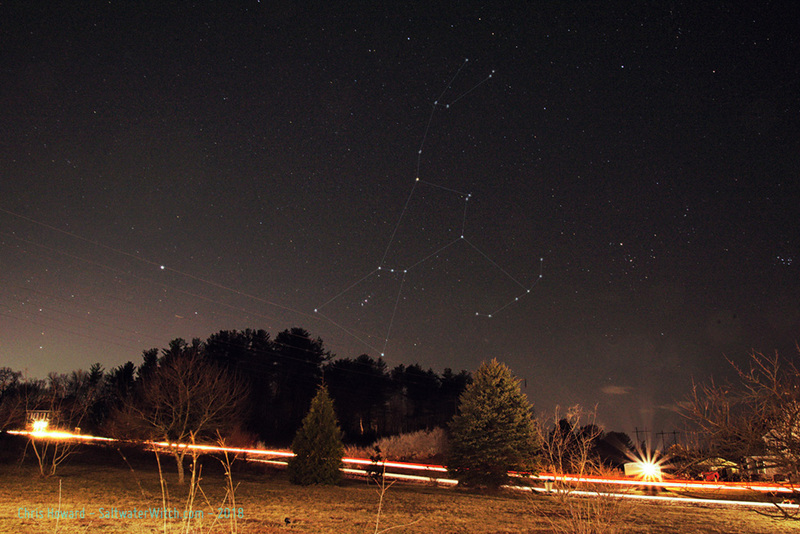 This is why the Orion Constellation is arguably the sky's most impressive constellation. 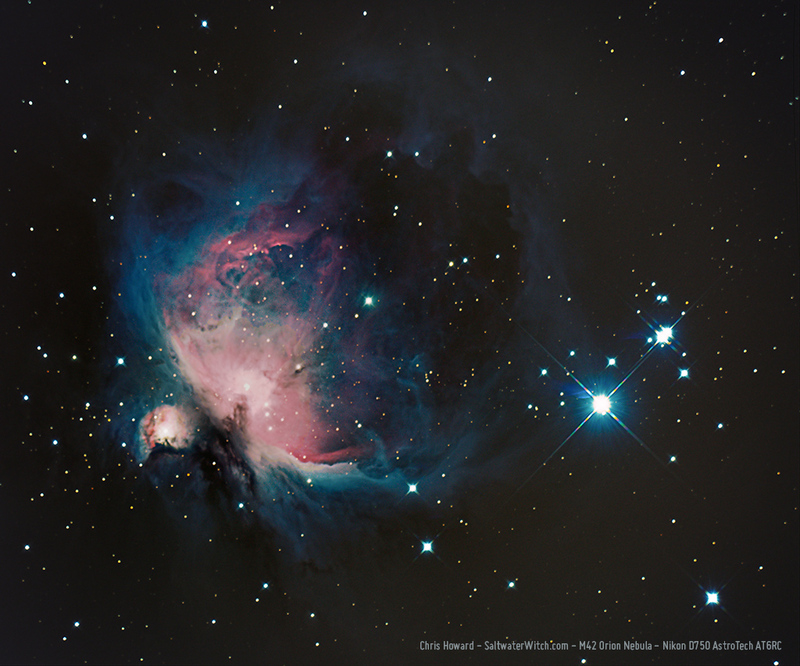 NOTES: 31 x 300 second exposures for each, with an additional set of 10 and 30 second exposures for the Trapezium in M42--that really bright triangular region. 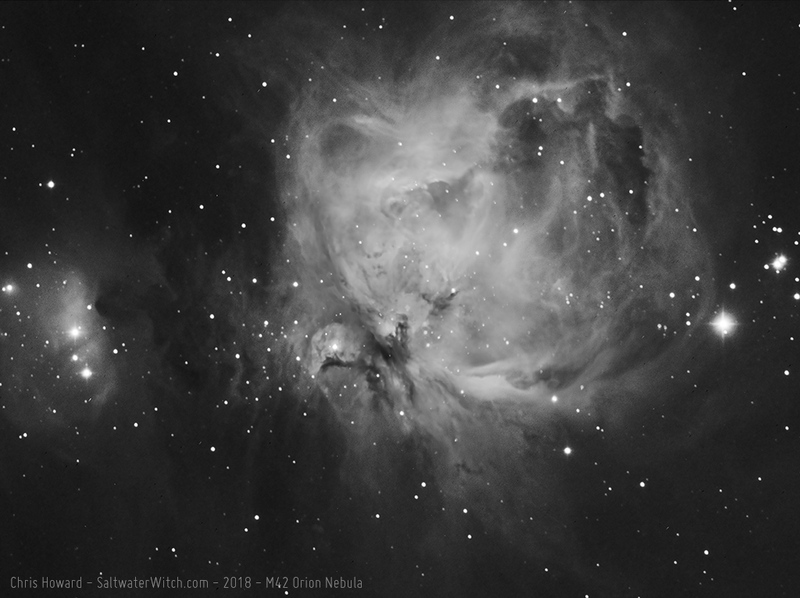 There's just so much fiery star forming action at the heart of the Orion Nebula that any exposure over a dozen seconds is going to blow out the whole area. 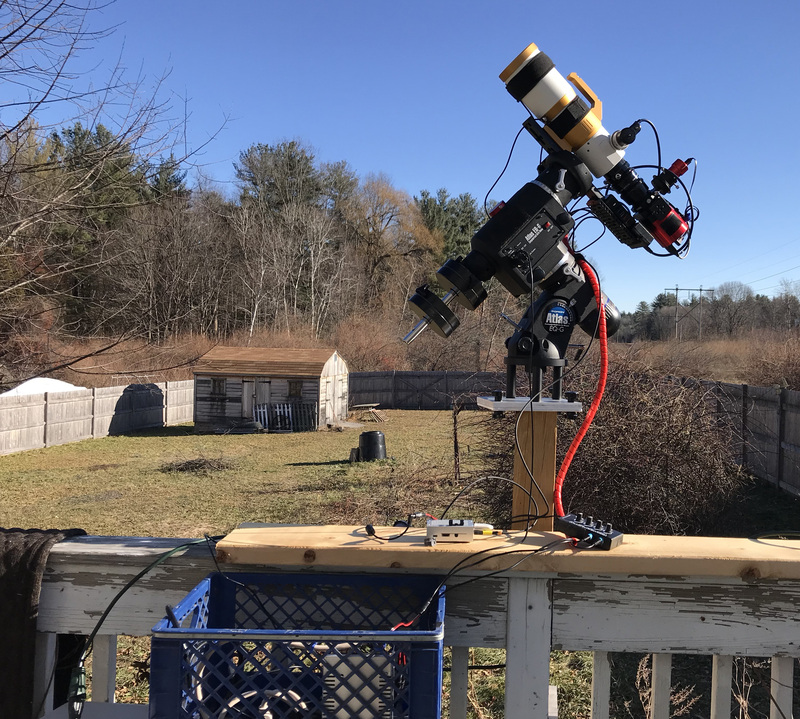 As the days become longer, as we swing around our sun, headed for aphelion in July (greatest distance from the sun), and our planet's 23.5 degree tilt is angled toward its rays, we'll be seeing less of the constellation Orion--in normal viewing hours. 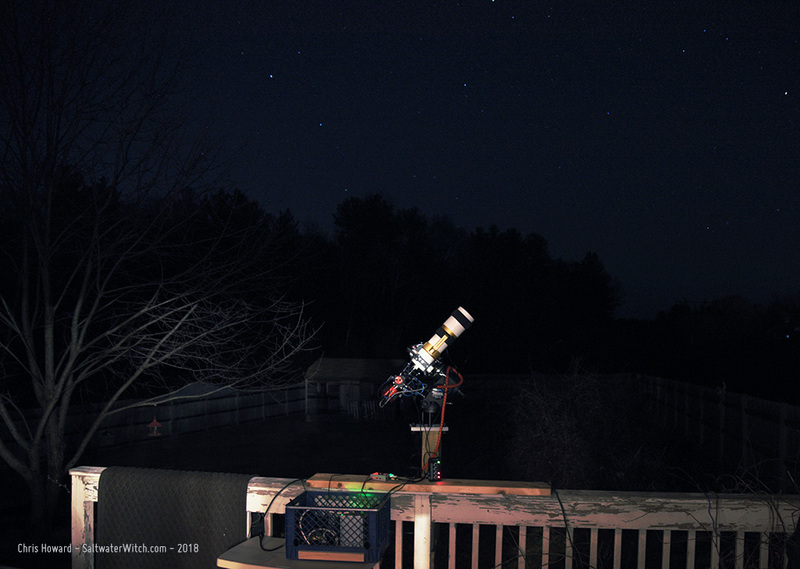 I took this 30 second exposure last night around 9PM, and Orion is already moving below the trees to the southwest. 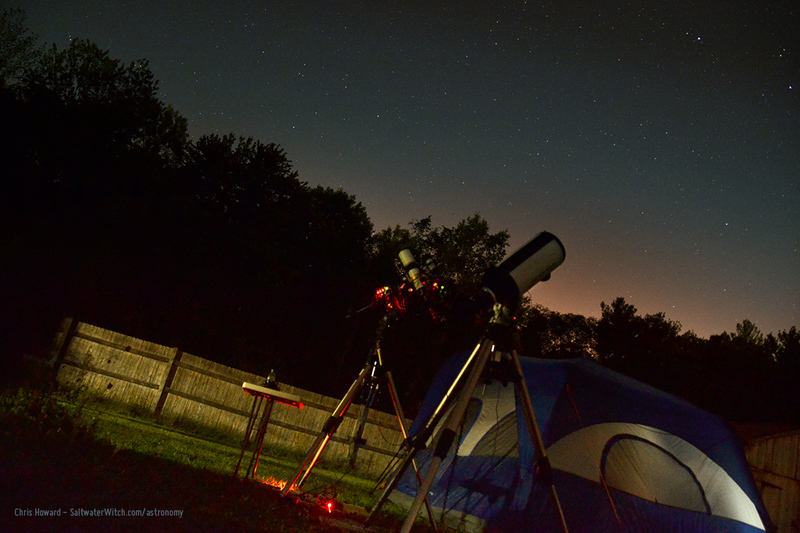 That's the Pleiades (M45) at the far right. I also happened to capture the headlights and brakelights of Alice's car as she's driving past to our driveway, almost home after picking up Christopher from work. The temps are nice--downright warm compared to what we've been hit with over the last couple weeks. The clouds are the problem. They gave me two hours of clear skies, and I spent them taking a batch of five minute exposures of M42, the Orion Nebula. 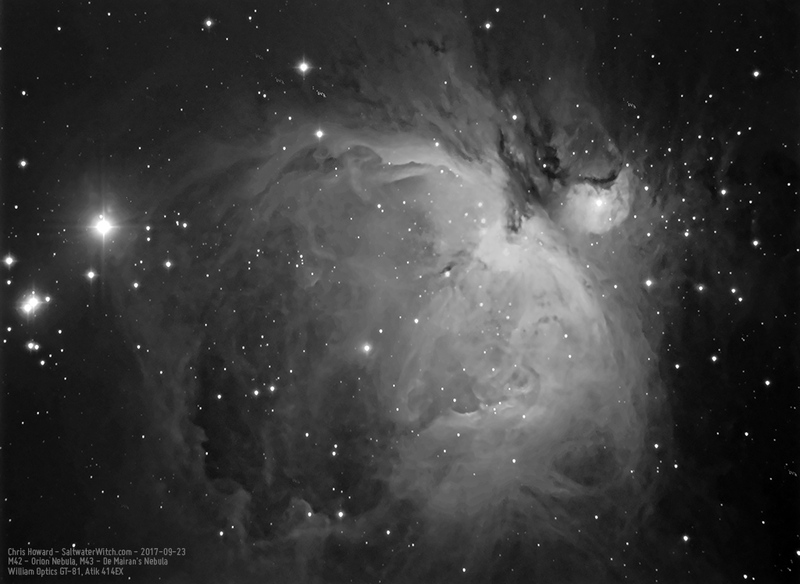 (Atik414Ex mono CCD, William Optics GT-81 + 0.8x Field Flattener/Reducer f/4.7, iOptron CEM25P EQ mount, Astronomik 12nm Ha filter, WO 50mm guidescope with ZWO ASI120S-MM guide cam, INDI/KStars/Ekos observatory control).